My Granny, Mary Barry, nee Griffin, sadly passed away on April 29th. She was an amazing woman who had led a long and happy life -- she was just one day short of her 80th birthday when she died. She had been in poor health for quite some time, so it didn't come as a surprise, but obviously we had hoped to have her around for a bit longer than we did -- in the end she slipped away quite quickly. The only upside to that was that she enjoyed a good quality of life all the way to the end -- even on the day of her death, she managed to get out of bed for a few minutes. I was very close to my Grannny. She was like a second mother to me. She was also the last of my grandparents to pass. I'll miss her dreadfully for the rest of my life, but at the same time I know I'm lucky to have had her in my life for as long as I did, and I feel blessed that I was graced with such a loving, funny, intelligent, warm grandmother. Even in death may she be tirumphant!!!! Hi everyone, and welcome to the May issue of the Shanville Monthly. As I noted above, this is a sad time for me, but my Granny was completely unafraid of death and a firm believer in life going on as normal once you lost someone you loved -- it's where I get much of my matter-of-fact approach to death from. She wouldn't have wanted any of her family to sit around moping -- she'd be much happier for us to celebrate her life rather than brood about her passing. So, even though I'm going to be hurting inside for a long time to come, I'm going ahead with my May tour of the UK and Ireland, and I'll be thinking of her with every book that I sign and dedicating it to her honour. I wouldn't be where I am today without the support and guidance of my Granny, so it seems like a fitting way to pay homage to her. Because she died the day before my tour was due to start, we had to cancel the first half of the tour on short notice. My sincere apologies to anyone who turned up at any of my Irish event and was disappointed not to find me there -- but the good news is that you shouldn't have too long to wait for your next opportunity to meet me, as Im planning to re-schedule all of my Irish events for later in May, most of them just after the UK leg of my tour. You can find out more about the re-jigged tour dates below -- but please note that I am awaiting confirmation of the refreshed Irish dates -- because of the bank holiday, it will be Tuesday, May 3rd at the earliest before I can confirm the new dates. Please check this issue of the Monthly again, closer to the time of the Irish leg, before travelling to see me. Right -- back to normal business!! May is a busy month for me, with the release of Ocean of Blood in the UK, Ireland and USA. The book has been attracting very positive early feedback from fans and reviewers, which is always a pleasant sign! You can read more about the release of my latest book (the 29th of mine to see print in the UK!) in the next entry, and there's plenty more news to report on too, from an incredible online competition being run by my British publishers, to details of an Irish TV show which I'll be appearing on, to new covers and interviews and more! So let's have no more gloominess -- time to push on -- Granny Barry would expect nothing less of us!!!! Early response to the book from fans has been incredibly positive -- many are hailing it as my finest book to date -- so hurry and buy a copy ASAP to find out what the others are raving about!! The book should be available in all good book stores, but you can also order it online if you prefer, either from Amazon UK if you live in the UK or Ireland by CLICKING HERE, or from Amazon USA if you live in the States by CLICKING HERE, or from Amazon Canada by CLICKING HERE. The book is also available as an eBook. To buy it from Kindle if you live in the UK, CLICK HERE. If you live in the USA and want to buy it from Kindle, CLICK HERE. I think I prefer this one!! The book should be available in bookstores everywhere, or you can buy it online from Amazon UK by CLICKING HERE. Also now on sale in the UK and Ireland is the first collected volume of The Demonata, containing Lord Loss and Demon Thief. I wrote about the new, collected volumes in last month's issue of the Shanville Monthly, so go check that one out if you want to learn more about them and their release dates. The first volume should now be available in bookshops everywhere in the UK and Ireland. Or if you want to buy it through Amazon, CLICK HERE. DONATE TO THE OCEAN OF BLOOD!! To tie in with the release of Ocean Of Blood, my UK publishers, HarperCollins, have launched a VERY exciting game, open to fans everywhere in the world, where they’re trying to collect a million drops of blood to fill an online, virtual OCEAN OF BLOOD!! Basically, through an app on their Facebook site, you can very simply enter the competition by clicking a button to donate a virtual drop of blood. As soon as you do that, you have the chance to win an immediate prize—there are lots of cool instant prizes, such as iPod Nanos, iTunes vouchers, signed copies of Ocean Of Blood, and more!! Every entrant is also entered into a draw to be held at the end of the competition, where the main prize is an iPad 2 with all of my eBooks on it, as well as a unique signed cover!! This is a viral competition, the aim being for fans to spread the word to their friends, family members and associates, to get as many people entering the game as possible. Therefore, you can enter as many times as you like, but only if you virally spread the game every time, either by sending links to your Facebook contacts, your Twitter contacts, or to email addresses. It’s simple and straightforward, fun to play, with LOADS of great prizes up for grabs—so what are you waiting for?!? Click on the following link and get gaming—and may the luck of the vampires be with you!!!!! Please note, this game is being run by HarperCollins—if you have any queries about it, you should contact them via the links on their Facebook page. I have added the UK artist’s working drafts of Palace of the Damned, the third Mr Crepsley book, to my site. 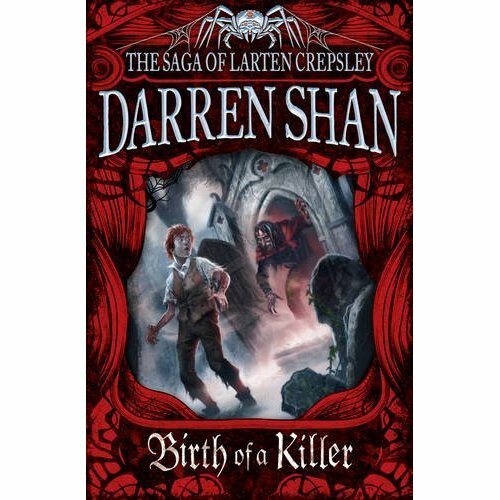 If you want to chart the evolution of the cover, you can check it out by clicking here: http://www.darrenshan.com/covers/country/united-kingdom/ Or, for higher res versions, you can check out the artist’s own site here: http://davidwyatt.posterous.com/palace-of-the-damned The final cover image will be added later in the year, once it has been completed. This is probably my favourite UK cover in the series to date—I hope you like it as much as I do!! I recently gave an interview to German website, Zauberspiegel, in which I chatted about a variety of my books. You can check out the English verison by CLICKING HERE. I also gave an interview to Adventures In Children’s Publishing, in which I talked about some of the practicalities of being a writer. You can check it out by CLICKING HERE. TOP TEACHER AND STUDENT HAVE TOP READING TASTE! Many congratulations to literacy teacher Debi Clark, who was recently named My Favorite Teacher in a Barnes & Noble contest in Jonesboro, USA. The reason I spotted this was because of the book she mentions when talking about getting her students interested in reading. You can find out what it is, and learn more about Debi and the award, by CLICKING HERE. Congratulations are also due to Elijah Barnett, who was Student Of The Week in the Arizona Daily Star. Like Debi, Elijah has excellent taste in books, as you’ll find out if you read the online article by CLICKING HERE. Isn’t it a wonderful world where students and teachers alike are united by their bloodthirsty love of all things Shan?!? 23rd May -- IMPORTANT UPDATE -- due to a death in the family, I had to POSTPONE the Irish section of my tour. Please find details for the RESCHEDULED Irish events below. We have managed to fit most of the events into May slots, except for Dundrum, which will now take place in October during my tour for Palace of the Damned-- exact date To Be Confirmed in a later issue of the Shanville Monthly. public signing, O'Mahony's Tralee, Castle Street, Tralee, Co. Kerry. public signing, The Crescent Bookshop, Crescent Shopping Centre, Dooradoyle, Limerick. public signing, Waterstones Cork, 69 Patrick Street, Cork. public signing, Easons Newbridge, Unit 19/20 White Water Shopping Centre, Newbridge, County Kildare. public signing, Easons Dundrum, 12-14 Dundrum Town, Dublin 16.
public signing, Waterstones Belfast, 44-46 Fountain Street, Belfast BT1 5EE. 2.30pm -- public signing, Easons Newbridge, Unit 19/20 White Water Shopping Centre, Newbridge, County Kildare. 2.00pm -- schools event, Waterstones Belfast, 44-46 Fountain Street, Belfast BT1 5EE. pm -- event with Fighting Words, Dublin. I will also be doing the following events in the UK and Ireland between the end of the May tour and my next major tour in October.